Princess Scooterpie - A Motorcycle Diva who likes to moto wander & write about it. : The best Mother's Day Present! And you and your Miss Scarlet will be slicked up and ready to go! you're so easy to please. 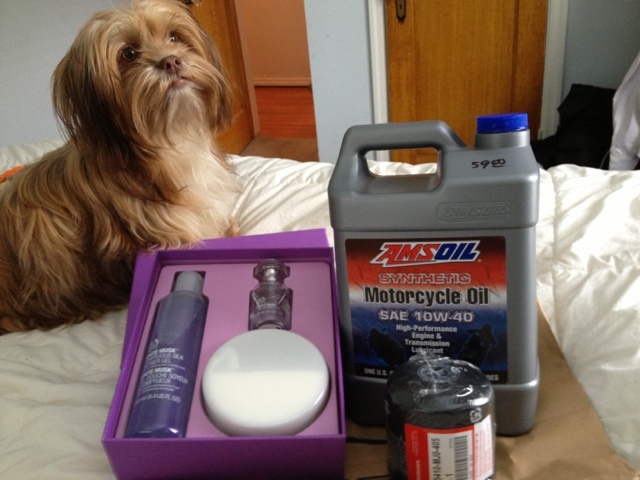 an Oil filter and a jug of oil. I like the way you tharencbalsoink! I am very loved and I am grateful for those who love me! My hub has worked so hard today, breakfast in bed, presents and then he cleaned my bike, changed the oil and made me dinner and is cleaning up the kitchen too boot! I also got to nest in my jammies & watch movies with my kiddo all afternoon. Sounds like you had the perfect day! And you really scored with the presents ... Yay! A woman who has her priorities straight! Happy Mother's day! as bluekat says "a woman with her priorities straight." but also a great family that knows you well.